Learn the Anterior shoulder stabilisation using arthroscopically introduced bone block and Arthrex TightRopes-RT surgical technique with step by step instructions on OrthOracle. Our e-learning platform contains high resolution images and a certified CME of the Anterior shoulder stabilisation using arthroscopically introduced bone block and Arthrex TightRopes-RT surgical procedure. Anterior shoulder instability with concomitant bone loss from the glenoid and/or humeral head represents a surgical challenge. Critical glenoid bone loss of greater than 20%-25% is a recognised cause of failed arthroscopic Bankart repair. A ‘subcritical’ bone loss greater than 13.5% has also been proposed as clinically significant and has been associated with an unacceptable functional outcome independent of redislocation. In most cases these bone defects are bipolar lesions with concomitant bone loss from the glenoid and humeral side and usually can be managed with glenoid-based surgery. The Latarjet procedure has been the workhorse for these difficult cases. 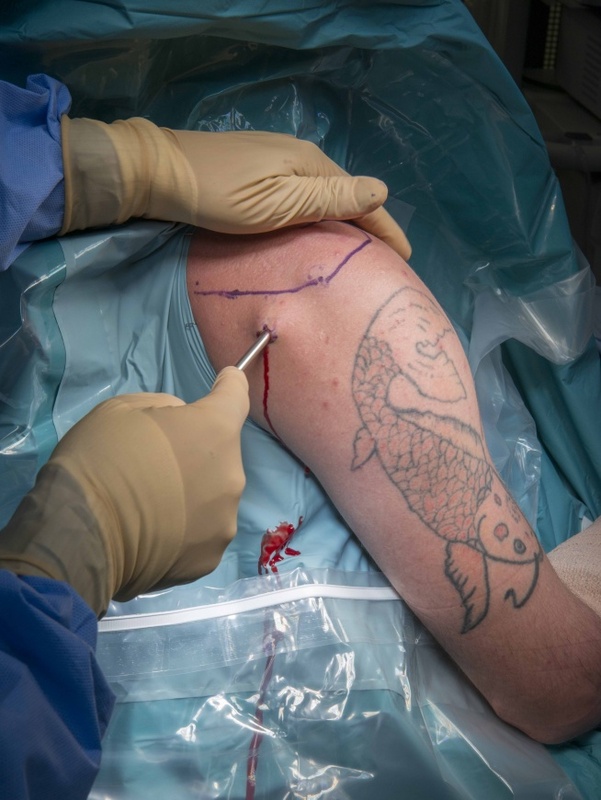 However, it offers a nonanatomic reconstruction and its arthroscopic version although is gaining increasing popularity, is associated with a high complication rate and a steep learning curve. During the Latarjet procedure 2 metal screws are usually used for the fixation of the coracoid graft on the glenoid. However hardware-related complications are the most common cause for repeat surgery. These include screw migration, loosening, or breakage and hardware irritation. Boileau has reported a 91% union rate for arthroscopic Latarjet using a single suture button fixation device. The construct is secured with a sliding locking knot. Anterior bone block procedures including tricortical iliac crest graft and distal tibial allograft have also been described for cases with significant bone loss with good results. This an arthroscopic technique that allows a tricortical iliac crest graft to be introduced through the rotator interval on the anterior glenoid neck. The graft is positioned flush with the bone using a posterior glenoid guide and secured in place with 2 Tightropes-RT (Arthrex, Naples, FL) which are adjustable length-loop devices and tensioned between cortical buttons with a suture tensioner. The fixation is knotless. A biomechanical study has shown that the median ultimate failure load after coracoid fixation with 2 metal screws was 202 N (range, 95-300 N). Another study has shown that the ultimate failure strength of the Arthrex knotless ACL TightRope-RT as a construct was 859 N, considerably higher than the strength required for a Latarjet procedure. Institution :The Queen Elisabeth Hosptial , Birmingham ,UK.